Following his interest in Earth Science, Pearce earned his BSc in Earth Science at the University of Victoria in 2013. His honours thesis focussed on the trace element geochemistry of the Troodos ophiolite. After graduation, Pearce worked with the BC Geological Survey to develop geochemical exploration techniques for Nb, Ta, and REE. Next, he practiced geophysical consulting for mineral exploration, aquifer studies, seismic hazard assessment, and major infrastructure projects across Western Canada and the US. Organic compound pathfinders are a promising and under-researched tool for non-petroleum based mineral exploration through cover. In terrain that is buried by sequences of till and glaciolacustrine deposits, geochemical signals from traditional commodity and pathfinder elements may be complex and far travelled. Organic compound concentrations in soil increase in response to economic mineralisation and have the potential to identify targets beneath overburden. 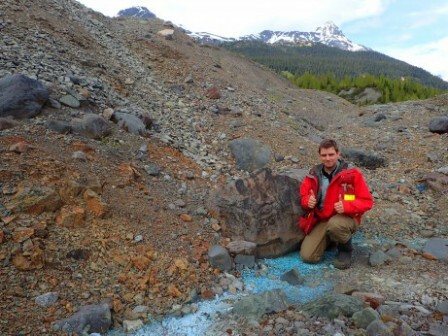 The purpose of this research is the advancement of organic compound pathfinder techniques to explore for Cu-porphyry deposits in British Columbia. This project aims to identify the physical, chemical, and biological links between organic compound abundances at the surface and the buried footprints of economic mineralisation. Development of a robust, cost effective, and statistically tested analytic technique for organic compounds in soils at ultra-trace concentrations will be a significant milestone for this area of research. Targeted sampling of multiple soil horizons will provide guidance on the optimal media to collect for future field work.